Kick for Detroit today in Los Angeles will raise money for the Jewish community from former Detroiters – but is there a future? Lights made the already stifling heat even more unbearable. How they could continue to play? Yet, an hour into the show, the pace and intensity of the music was growing. The crowd jumping up and down to the beat of the music. Rivers of sweat ran off the drummer who was shirtless by the end. Matisyahu, already drenched head to toe, returned with his signature anthem of peace, â€œOne Day.â€ He brought dozens of concert-goers on stage to accompany him. St. Andrews Hall pulsed with sweat, cheers. Across the room of outstretched arms the crowed chanted the words at the top of their lungs unmoved by the searing heat. In this blighted neighborhood, Detroitâ€™s Jewish community is banking on this collective to be a hub of programming for young adults. Theough opened only months ago, at least fifty people showed up with just two days notice to meet the singer and enjoy a vegan feast prepared by a young kosher caterer. When I was growing up in Detroit in the 1970â€™s and 80â€™s, the notion that Jews would return to the city â€” literally the areas of old Detroit that housed the core of the community for a hundred years â€” was a remote fantasy. The community had been moving to the suburbs since the 1950â€™s. By the time I was born, the Jewish community, all the synagogues and temples had moved to the suburbs. My parents choice to live in the city was never quite understood. Two small shuls stuck it out. Itâ€™s no secret that Detroit is on the ropes. The city is a shadow if its former self, even with gorgeous new stadiums for baseball and football. Miles of the city have been razed and nature is reclaiming them. Miles of empty commercial real estate line the streets of the sprawling suburbs. Corruption and mismanagement were rampant and reached their zenith when the mayor was arrested two years ago. However, Detroitâ€™s Jewish community, who live almost entirely in the suburbs, is not ready to give up on a city that has such a rich and vibrant Jewish past. In addition to the new Moishe House, and a Repair the World volunteer, a landmark synagogue recently was saved. The Isaac Agree Downtown Synagogue was about to close its doors and sell their building after 90 years. The situation had been so bad that they needed to recruit the bartender of a nearby night club to make a minyan. A group of my contemporaries, old shul members, and younger Jews have banded together and saved the shul. The compelling saga was even covered by NPR who ran a story about it. Detroitâ€™s Jews are resilient and instead of closing the Downtown Synagoge, they celebrated their 90th with 300 people. 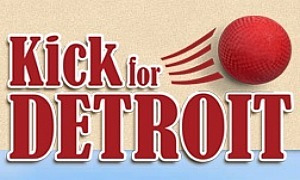 Kick for Detroit is today – you can make a donation to help the rebirth of Jewish life in Downtown Detroit. Ezra Furman: Orthodox Indie Superstar in a Dress? Good write-up. Bummed I missed the show. Didn’t know about it. The big misconception about Detroit is that it is changing. On the whole, there are always small changes, like the recent “rebirth” of downtown, but in general, not much has changed since the 67 riots. Steadily the population keeps declining, but this has always been happening. For most of your readers, in reality, the city hasn’t changed much in their entire lives, and mostly likely won’t for another 30 years. This is on the whole of course, but if you are into niches and segmentation, there’s a whole lot of up and downs that occur quite frequently. As someone who poured money into Detroit, trying to renovate properties and been burned numerous times, I’ve given up on its rebirth and renovation. Instead I just use it, like a venue or any other location. Too much corruption and attacks on us suburban taxpayers for my liking.